Only my thoughts with me on the train. 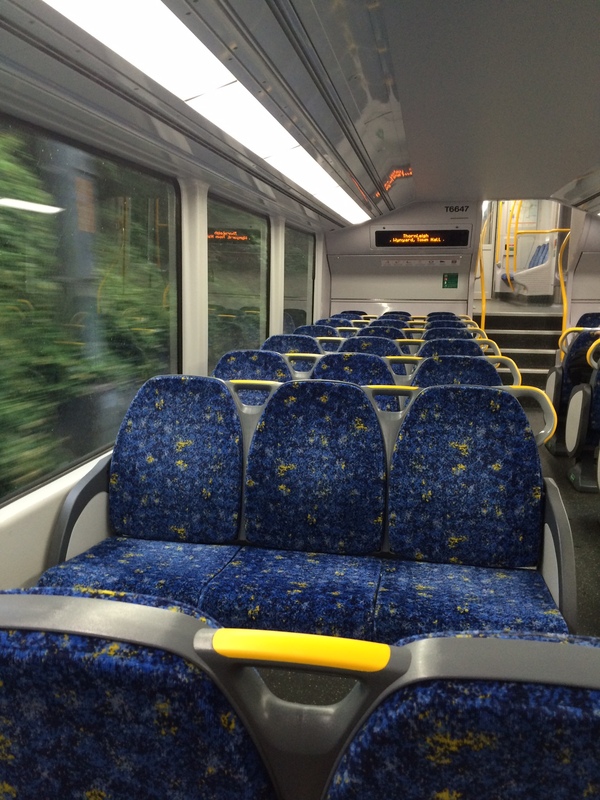 They kept me company for a couple of stations and then it was only me and the silence. Beautiful silence. There was the rhythmic beat of the train’s engine, the metal wheels rubbing against the rail and the drivers’ announcements but I tuned in to my heart’s beat and the movements of my breathing. I had a moment of mindfulness and felt immense peace. My journey with mindfulness started about four years ago. My initial introduction was through books, followed by a 8-week MBSR program. I’ve lapsed here and there but in the last few months my meditation practice has gained momentum again. I joined the mindfulness summit in October and it was very energising and I’m committed to keep the momentum going. Mindfulness has a very strong impact on my anxiety. When I manage to maintain the practice I feel a much lower level of agitation in my mind. The problem is to keep the practice going consistently. You skip a few days and, at least for me, it’s very hard to pick up where you left off. But I feel I’m heading in the right direction now. I’ve embarked on trip to go nowhere, a trip to the present moment. Time is something we experience every moment of our lives. We have 24 hours of it every single day but it never feels like we have enough of it. “If only I had more time I wouldn’t be so busy” – that’s what we hear from others and tell ourselves again and again. But honestly, I think if we were given a few extra hours in the day, we would still continue to fill up every moment with physical or mental activity. That’s why this fantastic book, Overwhelmed, spoke to me in so many levels. 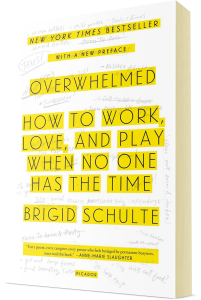 The writer, Brigid Schulte, is a frenetic working mother that goes on a quest to find out why everyone, including herself, is so busy and investigates solutions to mitigate the overwhelm. The book paints a precise picture of my own life; always running around adding one thing and another thing to my to-do list and feeling like time evaporates before I can accomplish anything substantial. Schulte recounts stories of women that work to the point of exhaustion caught in the illusion of becoming the “ideal worker” and “ideal mother”, confused with so many pressing demands that they can no longer decide what’s really important. They are left feeling ambivalent, half-hearted about everything they do. Women have so much on their plates that their minds are always occupied and preoccupied with their endless to-do lists. Scientist call this “time pollution” or “contaminated time” – time is never set exclusively for one task, there are always other activities happening in the back of our minds. I can attest that this is exhausting and mentally draining. No wonder women are left with no time or energy for leisure, love or play. But Schulte also came across women that seem to have found a good balance in their lives. These are women that neither try to live up to impossible ideals nor set unrealistic expectations. They know what’s really important in their lives and have made this a priority. After speaking with some of these women, several scientists, social researchers, psychologist and life coaches, Schulte learnt a few things that she then implemented in her own life to move “from the chaos if living fast, feeling breathless, and stuck on a storm of Time Confetti” towards time serenity. Time Confetti is what she calls our fragmented lives that seems to be scattered all over the place – in her words “one big, chaotic burst of exploding slivers, bits, and scraps” that never amount to anything. So, one of the first things Schulte did in her Journey to time serenity was to stop the Time Confetti. She worked with a “productivity expert” to help her regain focus of what was import and prioritise it. Put your to-do list on paper. The book says that in this way “your brain doesn’t have to expend energy to keep remembering it”. I’ve found additional benefits. Maybe because I’m a visual person, seeing my to-do list on paper makes me realise that sometimes the tasks ahead are more doable than I thought and some of them can be delegated, postponed, etc. Just seeing them written down makes it easier to manage them. There are plenty more advice and inspiration that you get from Schulte. Reading this book was definitely a good investment of my time. Now I’m on my own journey to time serenity.